In 1998, Hurricane Georges swept through the Dominican Republic. In its wake it left 380 casualties and over $1 billion in damages. The hardest-hit areas included those involved in crop production—including, of course, tobacco. 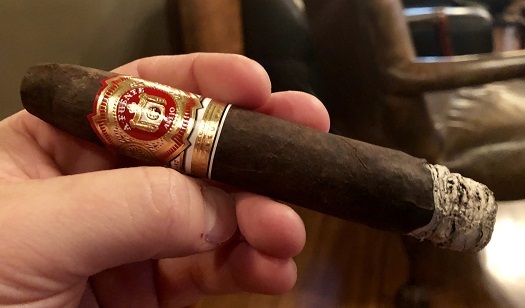 Not long after the hurricane, Arturo Fuente experienced a predictable and critical shortage of its prized Fuente Opus X sun-grown wrapper leaf. Instead of postponing production until more wrapper was ready, the Fuentes wrapped the Opus X cigars in a dark Connecticut Broadleaf wrapper that had been aged in cognac barrels. With that, the Añejo line was born. When most people think Añejo, they’ll likely conjure images of the No. 77 vitola—more commonly known as The Shark. This unique format is best described as a tapered pyramid that morphs from a round head to a sharply box-pressed foot. I didn’t find The Shark at my local shop; it’s rare, so that isn’t surprising. But I did find a box in the No. 55 size, which is a torpedo measuring 6 inches long with a ring gauge of 55. I bought a couple for this review. Not including crazy Illinois taxes, they cost me $15.25 apiece. In my book, that price tag makes the Añejo No. 55 a super-premium. Expectations are elevated. Fortunately, the cigar comes dressed to impress. In addition to its toothy, rustic wrapper leaf and regal band of red, gold, and white, the bottom two-thirds is embraced by a cedar sleeve and a red foot ribbon. At the midway point and beyond, the body and spice intensify—though perhaps not to the degree some might expect, especially those who spend a lot of time with Nicaraguan cigars. The white pepper becomes black peppercorn. The black coffee becomes espresso. Dried fruit (think raisin, apricot, fig) and cocoa remain core to the profile. I never had to go back and adjust the burn in any way after setting an even light with the cedar sleeve. The other physical properties are also exemplary (and appropriate for a cigar of this cost). The white ash holds well off the foot. The smoke production is voluminous. And the draw is clear throughout. Perhaps, like me, it has been a long time since you fired up an Añejo from Arturo Fuente. Might I recommend you reacquaint yourself? The No. 55 is another stellar smoke from the world’s great tobacco family. It earns a fantastic rating of four and a half stogies out of five.